A visual and musical treat for any little dinosaur lover! Tapejara the Pterosaur (‘Tappy’) is on a mission to find out who is stealing the dinosaur eggs. To solve the mystery, Tappy enlists the help of his friends: Nina, the dancing dinosaur; Diploducs the life-saver (because we all know that dinosaurs can’t swim); T-Rex and Spinosaurus, the hilarious squabbling puppets; Struthimomius, the fastest dinosaur of them all; Supersaurus, a big show-off who really gets the audience rocking; Triceretops, a cool, laid-back blues singer; and the sneaky menace, Cylophesis. 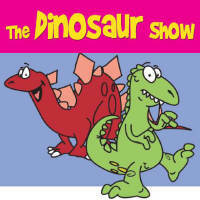 Over the past five years, this wacky dinosaur adventure has entertained and enthralled thousands of children 1 – 7yo.